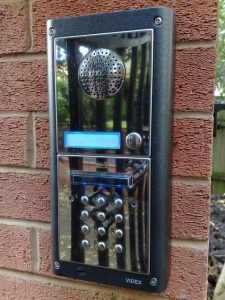 If you believe your home or commercial premises would benefit from additional security, you will find that an intercom system is a great advantage. Our skills extend to being able to design an intercom system that is tailored to your needs, offering you the most benefit. An effective intercom system will give you easy and efficient control over entry to your premises. You will be able to converse with the party seeking entry, and also you will be to see them if required. You can decide whether or not you want to allow someone to enter your premises in comfort and security. We can design an intercom system that suits your needs. This security system can be used in conjunction with any gates or doors that we install, or with your existing barriers. Our electric gates and garage doors are second to none and the intercom systems we design and install are no different. Get the best audio and visual security equipment for your home or business premises. You only need to advise us of your requirements in your free initial consultation. From there, you can leave the rest of the work to us. We will carry out a survey to determine the system that your home can support. We will then design and install all the equipment on your behalf. At Castle Doors & Gates we only use the finest quality equipment and products from trusted suppliers. This allows us to give better guarantees with our work than is normally the case. Our made to measure service extends to our intercom systems. This means we can ensure that the security equipment and intercom systems work in perfect harmony with all fitted electric barriers.